My mom makes these for events quite often and they are always gone before you know it. So I decided to try for myself when I had to take a platter! The same thing happened and they were gone so fast! 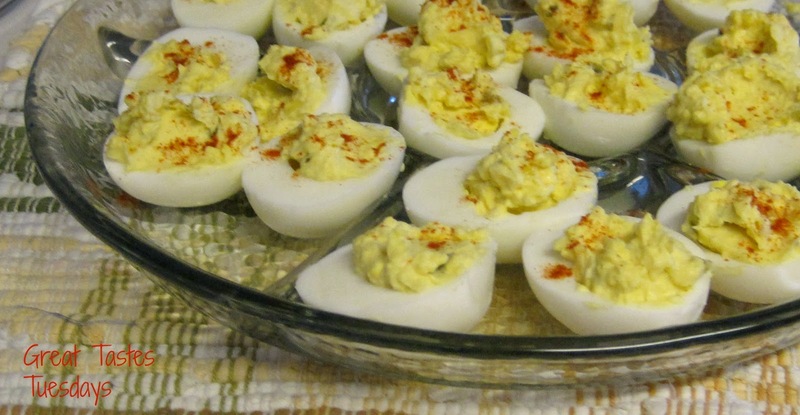 People love these deviled eggs - try them today! Stay tuned for tomorrow's recipe! I am so excited to announce the great taste for the week! One of my most favorite recipes I have tried this week and it is so good! It looks amazing! Boil your eggs in boiling water for 12-14 minutes. Make sure you are certain they are ready inside! When you finish boiling them run them in cool water and they are easy to shell. When you have all of your eggs shelled cut them all in two. Dig out the egg yolks and place them in a bowl while you place the egg whites on a platter. Smash all your egg yolks very finely with a fork. Add the miracle whip and sweet relish and mix well. Mix in the onion salt, salt, and pepper to your liking. Place a scoop of the yolk mixture in each egg hole. Sprinkle with paprika on top and enjoy your eggs! These look so good! I would love to have you share these at my link party! I might just have to make these for get togethers at church... thanks for the recipe! I'd be thrilled if you'd link up at this week's Off the Hook! Yes they are good! Thank you for the invite! Thanks for coming over and linking up! Pinning these right now!